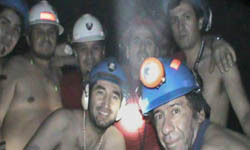 On August 5, 2010, the San Jose copper-gold mine near Copiapó,Chile collapsed stranding 33 miners in a large cavern more than 2,000 feet below ground. A new movie has just been released about the incident, The 33. All of the miners were believed to have been killed but after 17 days a note, taped to a drill bit was recovered from one of the bore holes that said, "Estamos bien en el refugio, los 33" (English: "We are well in the shelter, the 33 of us"). From that moment on the world began to watch the attempts at their rescue. After more than 2 months they were brought to the surface alive. Yummy math created an activity about the incident as we all kept abreast of their rescue through nightly news. This activity is what we created then and with the new movie opening it is again on topic. Do the math. Students are asked to make a number of volume calculations ... the miners living space, the amount of ore in the escape shaft, the lateral surface area of the metal shaft lining, and their survival chamber's depth under the surface of the earth.